A priced 2016 edition book entitled â€œIntegrated reproductive management in dairy buffaloesâ€ is available for sale @ Rs 200/- from NIANP, Bangalore. The order can be placed through the Incharge KMBS, NIANP, Bangalore, paying the book price + extra postage charges. The book provides a snap short analysis and implementable solutions to the problems of buffalo reproduction. It contains 13 chapters with detailed accounts on opportunities and problems of dairy buffalo management; basics of reproduction; estrous synchronization; artificial insemination; strategies to reduce early embryonic loss; feeding strategies in different stages of reproduction; management of milking; management of endocrine disruptors and heat stress and alternative protocols of in vitro early buffalo embryo production. The book in this form is useful for the academician; technical experts, students; general readers and educated farmers. 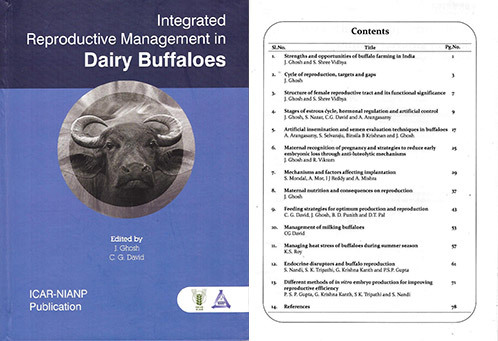 The blend of reproduction, nutrition and management related solution provided in this book for dairy buffalo management is unique and will fulfill the foreseeable demand of the people and policy makers who keep keen interest on buffalo farming and wants to improve their reproductive efficiency for the future.